Master is read only, updated via pull requests from develop or hotfix branches. Each update results in a release candidate being built and deployed to the staging system. Release candidates are deployed to production after manual approval. Feature branches are created based off develop, or from the last commit that has been merged into master. A pull request from a feature branch to develop is built, deployed to a free test system where integration tests and acceptance tests (automatic & manual) are executed. When successfully tested and reviewed, the PR gets merged, so that it will become part of the next release (i.e. merge from develop to master). I would like to simplify this and get rid of the develop branch. The develop branch has mostly historical reasons and since it is always a successfully tested version, I think it is unnecessary to keep it separated from master. Removing it will also simplify the release process because there is no additional merge anymore. currently I am building pull requests for testing and merge commits for releases. Can I unify this? how to deal with hotfixes when the master is ahead of the latest release. Should I build and deploy releases directly from hotfix branches? is there a sensible way to deal with features that should be excluded from a release after they have already been merged? Is a separate develop branch really an advantage for these cases? Most of the time I end up reverting and re-reverting commits manually anyways. Dropping develop won't help (much) - you're not eliminating the problem, you're just transferring the develop-specific portion of the problem into master. Please note that I'm only referring to the release branches in the above image, not on what's happening in the trunk. the master branch is your trunk, this is where development happens with no speed restrictions (it's never merged into production). If a hotfix applies only to a production version but not to the master it is directly committed to the release branch. If it applies to both it's typically committed to master first and cherry-picked/double-committed to the release branch as well. 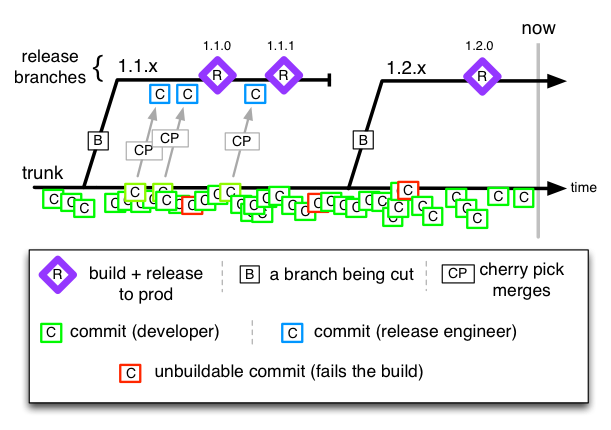 switch to continuous integration and reap its benefits (can be done at any time going forward), including in a progressive manner - gradually pull fewer and fewer feature branches. stop commits from going into develop, they'll be soon going straight to master. instruct developers to rebase their workspaces on master instead of develop. Let's say you take out the master branch (you can rename develop to master to confuse your team if you like later) and simply use tags for releases either on develop or hotfix branches. You took out a branch, but the difference is just a change in syntax. Change for change sake. Now let's say you actually take out develop with keeping the locked master branch. What will happen is that integration of code will slow, it will live longer separated in feature branches, especially close to release dates. This will Increase the difficulty of merging each time and slow the process down. Within the constraints you have laid down I don't see any positive effects of making such change. It would require relaxing the constraints, especially the first one. You are already building and testing code on each of the pull-request and hot-fix branches. This means that in aggregate, the sum of all branches pending on pull-request are your virtual develop branch. You can create a system when in a test environment, several pull-requests are cherry picked into a temporary branch that is not published to the main repository. This branch is used to integrate a test environment that includes master and several additional pull-requests, but once the testing is done, this branch is no longer available anywhere. When you create a release from master, you would usually create a tag on that release. Later hotfixes can use that tag to create a new hotfix branch from which a deployment will be made, even though the edge of master is already ahead. On this hotfix branch you would probably also tag a minor release, and make sure that the changes were merged into master. Removing merged features from a release is quite hard to do with git. The best mechanism for this would be to use git revert on the merge commit. But that makes it almost impossible to get these features/changes back, and history becomes all muddled. A much better way to handle separation for deployment of code, and release of features, is feature flags. If your developers can hide their features behind some conditions in the code itself, you could deploy their code, but turn off the feature. This is a separate topic, but a lot of information about this exists (including a Q&A on devops.SE). Not the answer you're looking for? Browse other questions tagged git release-management builds branch or ask your own question. What is the cleanest branching strategy to use when creating reusable artifacts?